Your landscape often sets the stage for your home’s interior, so why not make the most of it? One way to strengthen your landscape and enhance your curb appeal is to add imaginative and unique water features. 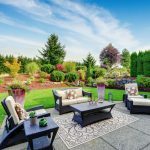 From fountains and ponds to waterfalls and custom water features, these soothing additions are a popular and affordable way to enhance your landscape. A pond is a flat low body of water which provides a fully customizable addition to enhance both large and small landscape designs. 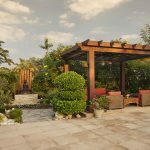 Not only do they add an essence of tranquility, but they can create an impressive focal point to your overall outdoor design. Best of all, ponds provide a versatile addition you can blend into your existing landscape design. Ponds can be natural looking or made from concrete with multiple levels, allowing the water to flow from one level to the other in different size water basins. If you desire to add more life into your ponds, you can create a koi pond for a more lively and invigorating outdoor water element. For those looking to become one with nature, remember that birds, frogs, and insects prefer to frequent a garden when there is always a source of water available. To encourage more wildlife, make sure you have plenty of indigenous trees and plant life in the area. Lilypads provide another great option for adding visual appeal to your backyard pond. Outdoor waterfalls provide an alluring outdoor accent that exudes the tranquil sound of trickling water as you relax in your backyard sanctuary. Waterfalls can be constructed in all shapes and sizes, so you can place them almost anywhere you like. Existing water features such as pools and ponds can be enhanced with a decorative waterfall feature. You can also choose to install a pondless waterfall, where the water cascades down something, such as rocks or a stone wall and onto a bed of ornamental gravel. The gravel or rocks typically cover a retaining basin to catch the water and a pump that will send it back up to the top of the waterfall. Water walls are a flat wall of water that combines the soothing sound of water with the visual aesthetic of a waterfall. Pondless waterfalls are great options for those individuals lacking the space or desire for a pond, yet love the look and soothing sound of a waterfall. The combination of water and fire is very intriguing. We can create customized features using both these elements to create the illusion of fire emerging out of the water. When these powerful features are combined in pools, they exude a very warm ambiance that is simultaneously visually compelling and soothing. 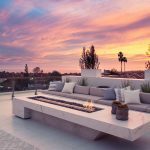 Another added benefit to these custom features is that the fire can also be enjoyed as a stand-alone feature by adding an Ethanol liquid burner or with a gas connection. We recommend using a gas connection.This allows the feature to be easily operated with a single switch or remote. Looking for something that speaks to the very heart and soul of your landscape design? Custom water features provide the perfect opportunity to enhance your backyard. Creative water features offer meaningful yet subtle methods to enhance an otherwise ordinary backyard. For your outdoor space, we can create an endless array of options to choose from, such as dazzling rock water pools with built-in fountains designed to reflect the greenery in your garden, to more contemporary looking water features that include sheet fountains, planter waterfalls, swimming pool lagoons, copper fire bowls and more. Depending on size, form, and shape required, we can build any type of water feature you can visualize! Your custom water feature may include multiple functions like a water wall, bubblers, and spouts. When it comes to creative design, the possibilities are endless. A delightful pond or a stunning waterfall can be the crowning element for your landscape. Not only will these water features serve as an attractive addition and enhance the architecture of your home, but they also create an aesthetic value that will increase the value of your property and your mood!